do more research on the matter. The good news is I’ve decided to fully embrace bottling butter. The thought of butter on my homemade wheat bread, even in the midst of a crisis, is just too enticing to pass up. So here’s how I’ve come up with my rationale for bottling butter in spite of what some information on the internet has said. I have a confession to make. I keep my butter on the counter by the toaster for when I have toast. I don’t refrigerate it. I’ve done it ever since I was a little kid, 'cause that’s just what Mom and Grandma did. I’ve NEVER gotten food poisoning—ever. Wipe off the top of the jars with a clean, sanitized towel or wash cloth. Place a hot lid and ring on the jar. Secure lids. The lids will seal as they cool. Once a few lids "ping," shake the entire jar while the jars are still warm, but cool enough to handle safely. You are doing this because the butter will separate and become foamy on top and white on the bottom. You want to blend it as much as possible while it cools. Repeat this every 5 minutes for about 15 minutes. You will begin to see a the same consistency in the entire jar. Canned butter will store for 3 to 5 years or longer on a cool, dark shelf. I’ve had butter as “old as 7 years" with no problems or compromise in taste. Know that your bottled butter will not re-melt after you’ve bottled it so you won’t need to refrigerate it after opening (yet another plus, in my book), though you should still plan on using it up within a reasonable amount of time. I've being reading up on bottling butter as well. One thing I've read is that it gets salty and grainy. Have you tried your canned butter yet? I'm wondering if it is true. Also did you use salted or unsalted butter? I generally store salted, but I wouldn't want the canned butter to be unusable because it was too salty. butter bell! That's what I was trying to think of when I wrote the article and just couldn't. Thanks for jogging my mind. You're correct. no pressure cooker or canner needed for the butter. I've used both kinds of butters, and yes, I've tried both. They were really good! YEAH!!!! I did a post on my FOOD STORAGE FRIDAY on this a few months ago and was informed it wasn't safe. Thanks for doing some research and helping me feel more confident with my canned butter! This is totally awesome. I can't wait to try this! I really, really want this canned butter thing to work because the powdered butter just doesn't appeal to me very much. I've heard of something like this before. Thanks for posting it. If I understand correctly, this procedure not use a BWB or pressure canner, just the heat from the process. Is that correct? I use a butter bell and it keeps the butter wonderfully soft ready to use, without it going rancid from exposure to oxygen. Get a butter bell online from Amazon and give it a try before you my a super expensive one that is highly decorated. I change my water daily and also wipe the outside of the bell with a paper towel so nothing contaminates the water to allow bacteria to grow. Each time I change the water, I put a touch of soap in and wash it, rinse in hot and then run cold water to cool the crock part again. It is great. Well done. I had someone ask me about this last night. I haven't done it myself and I've still wondered about it. The canning books also have no instructions for using a steamer canner, because they haven't been tested yet. However, the Dept of Agriculture has had over 20 years to test steamer canners and still hasn't done it. I can peaches and pears using my steamer canner. So, I'll rethink the butter! So I have some butter that I canned a while ago and haven't tried because I heard it wasn't good. I am so happy to have found your blog. I have question though...I didn't bring the butter to a boil, I just melted it. It was warm enough to seal but it didn't boil. Would you still use it? THANKS! If you merely melted the butter, then you can not be certain that you brought it up to a high enough heat. So, no. I wouldn't use it. Sorry. :-( That's not to say that boiling is indicative of having sufficient heat. You could have kept it at 200 degrees for 15 minutes and been fine. (Boiling occurs at 212 degrees) But since you don't really know that, I'd definitely pass on that butter. Barb, it's true that water boils at 212 degrees, but bacteria is killed at 180. When folks have a not so good taste in their butter, I suspect that it's because they overdid the butter treatment. A simmer is easily at 180-185 degrees. Just something to think about. Botulinum spores aren't. They don't die until > 240 degrees. Colorado State Extension Services disagrees with that statement, Matt. "Type A toxin is more lethal than types B and E. The toxin is a protein which can be inactivated by heating at 180 degrees F for 10 minutes" 6th paragraph down after the headline "The Botulism Organism." Kellene, you are confusing the toxin produced by the bacteria with the bacteria itself. The toxin is destroyed at 180 deg F and the bacteria which produces the toxin is killed at 240 deg F. When canning foods which may harbor the bacteria, you must raise the temperature to ensure that no spores remain to grow and produce the toxin. Also the food is spoiled when the bacteria grows. The toxin is destroyed at a low temperature of 180°F. However, the bacterium when stressed forms a spore which requires 240°F to kill. Consequently, it is recommended to heat your jar to a sustained temperature of 250 to 254°F, to ensure that the entirety of the contents achieve 240°F. If the spores are not fully killed, they will reactivate later forming live bacteria, which will subsequently create toxin, which will kill you. Botulism spores, which form whenever the Clostridium bacterium is under duress, need to be heated to 254°F in order to be killed. Otherwise the spores reactivate into new bacteria to grow in your food at a later time. That's why we pressure can meat, as you know. Clostridium thrive in low oxygen moist environments, like canned food. The toxin which is produced, is the most deadly on the planet and only a tiny amount can kill you. Although a soil organism, clostridium finds its way onto peoples hands, in their food, and in their gut routinely. We routinely treat people for Clostridium infections in their soft tissues and gut on an almost daily basis. Botulism spores are commonly in honey, which is why you don't give it to infants with an immature immune system. It's out there. I concur that the likelihood of botulism is extremely rare. As a result, we all may know 20 or 30 people who have "gotten away with it" by canning butter and other items. That doesn't mean botulism doesn't happen, or it isn't a risk, however small that may be. At the end of the day, the likelihood of a bad outcome is exceedingly small, but the severity of the outcome is great - death. The government regulations and advice seek to eliminate those few cases that occur every year. If I give you a bucket of 100,000 m and m's, and one is poisonous, how many will you eat? In my world, knowing both medical and microbiological information, it's not worth the risk. I just buy Redfeather butter. No offense meant, but the data provided does not adequately define the risks and consequences for the practice. We all assume the risks, benefits, and consequences for our behavior. Everybody should make their own informed decision. Good luck . Your instructions say to, "melt your unwrapped butter slowly." Does this mean we put the sticks of butter into the pot, wrapper and all? Or do you mean to wait until the very last minute to unwrap it? Sometimes in my effort to be clear, I make things more confusing. Yes, unwrap the butter and then melt it on a low heat...not too fast or you'll scorch it. Can this be done with the butter that you make yourself? We milk goats and make our own butter out of the goat's milk cream. I do freeze some, but we are trying to get off-grid and are trying to come up with electrical alternatives. Nope. It spreads on bread and such just fine. It just won't melt into a clear layer on the bread. You can still fry in it just fine though. "Know that your bottled butter will not re-melt after you’ve bottled it so you won’t need to refrigerate it after opening" Does this mean you can't melt it to fry something? The reason the FDA and other authorities do not endorse this process is, they have not tested it to confirm it is safe. They only endorse fully tested methods. Start a campaign. Get everyone you know to call or write your agricultural dept. and ask for testing. Contact your state AG university. Bug em till it's done. Will your canned butter melt when placed on items like: Mac & Cheese, hot mashed potatoes, etc. Mine does, but it has just a bit different texture. I loved the article and I might try it. I was wondering if it would work for homemade butter. We milk a cow and sometimes I skim the milk but I kind of quit making butter because we weren't using it up fast enough. Of course it will work with homemade butter. No problem! Whoa, I'd be careful with homemade butter. 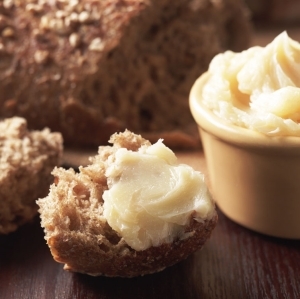 Homemade butter can contain much more liquid than commercial butter (often twice as much). This is already a questionable practice unless you add enough salt to lower the water activity to below 0.97. Using homemade butter just adds to the risk. I'm sorry to be so irreverent but I just have to laugh at this especially given that your other statement was inaccurate. There's a significantly higher risk to my consuming pasteurized, homogenized, and frankin-ized dairy products. What history book did you read that told of a multitude of deaths because of farmers who had the temerity to make their own butter? Geesh. Please go be a mindless drone somewhere else. Kellene, botulism is all about water activity. Homemade butter usually contans a lot more water than store-bought. That was my only point. As for my "inaccurate statement", it was anythying but. The ag extension said *precisely* what I did. Hey don't get me wrong: I think butter can be safely canned at home. But the only safe way to do it is to either get it thoroughly above 240 degrees -or- add salt to the aqueous portion of the butter to bring its water activity down to <0.97. This equates to about a 7% salt solution again for the watery portion of the butter only and will result in a very lightly salted butter when shaken up. yes, 240 degrees was a suggested tip, but you failed to see in the article that the botulism is rendered ineffective at 180 degrees...and that's what you stated was incorrect in my original article, which is incorrect on your part. 240 degrees is easily achievable in a solar oven, which is my favorite way to bottle butter, but there is no need to get to the boiling point in butter any more than it's necessary to get to that point in water either. thus using precious fuel in a survival situation to get it to 240 degrees is not necessary, especially if you keep your hands and your product away from dirt which is where the botulism spores come from primarily. I have been doing this for some time and believe me it is great ! I am trying to put up another 200 Lbs. (not a typo) for the long term. We us this just like regular butter. It does have a slightly different texture but melts fine and I sometimes skip the shaking step. This allows the solids to settle to the bottom and when I want clarified butter......I just open a jar of the butter labled as such, melt it and use it down to the settled solids. Looks, tastes and is just as useful as clarified butter because it is. When I started canning butter it was just over $1.00 per pound and last week a 4 lb package was $9.78 at Sams (Tennessee). No matter, if I don't have the availability to make butter from fresh milk, I will just open a jar and feast away. I just ordered 20 more pounds of cheese wax and will be waxing 1 lb blocks of cheddar. I store some mild (which will age to sharp over time), some medium to use ahead of the mild and sharp to use first. Parmesan , Ramano ....you name it. Any block cheese. I have a root cellar with two different compartments. One is 32-40 degrees in winter with approx. 85% humidity and the other stays in the 55-60 degree range with approx. 60% range. I have another separate cellar that runs in the 60-70 degree range and 60-70% humidity where I store grains etc. in sealed buckets with grains in mylar bags and oxygen absorbers. I canned my first jars of butter this weekend and it was so much fun! Pretty too. Hubby and the kids were fascinated. I can't wait to hit another sale and do it again! I have used a butter bell since I left home and had my own kitchen...I regularly purchase "rolled" butter from our mennonite friends. I can't wait to bottle some of that! Thanks for the specific instructions! I am 70 yrs old, live very remotely in a one room cabin with only a small solar system to run a small refrig (which has to be shut off at night! Hurrah for Blue Ice to hold it through the night!). I heat with wood, have no air conditioning of course, and can't even run a good fan. I've been bottling butter for about 3 years now. I store it in my pantry and my cabin in the summer often reaches an inside temperature of 90-93 degrees. I have not lost any butter ever. And I haven't died yet from botullism! If anyone has more information on the stability of homemade Ghee at room temperature I would appreciate an update. I use unsalted butter. Do I need to add salt to it? Also would it be safer to pressure can it? That will get it to the 240 deg. If you pressure can it you will lose some of the precious butter in the venting process. You can bottle salted or unsalted butter. I was thinking about canning butter in a pressure caner. I was hoping to avoid the texture problem by not boiling the butter first. When you boil the butter you are cooking a lot of the water out of it which is why the texture changes. I was thinking if I used a pressure caner I could just put cubes of butter in the jars without melting it first. The pressure and temperature reached by the pressure caner should kill all of the bacteria. What do you think? It has been a couple years since this was posted. What type of success have you have had? What type of applications did you use the butter for? Butter is so yummy. I use it for everything. It's fantastic! Kellene, I would like to bottle butter using a solar oven, like you did. Can you tell me what I am supposed to do about stirring the butter. I am not sure if I have to stir the butter with the solar stove. Love your web site and thank you for all the fantastic knowledge you pass on to all of us. Thank you. You won't need to stir, but you will still need to do the shaking, cooling process. This is probably a silly question, but can I make cream from milk and then use that cream to make the butter to can it? Cream is removed (skimmed/separated) from milk. You'd only be able to make butter from cream. However, if you're able to purchase whole, raw milk, you could skim the cream off yourself and then make your own butter, yes. I'm looking forward to having that VERY opportunity as soon as we get moved. I have got to try this. I love real butter on bread of every kind, sweet thru savory. If I can find it for less than $2/lb I will stock up and can. As always Kellene, you are awesome. I bought a 50lb block of butter from my local bakery about 5 years ago. I canned all of it using the same method mentioned above. I have been pleased that even after 5 years the butter is good. I think it seems slightly saltier than regular unbottled butter. I have wondered if that is because some of the water evaporated out of the butter in the simmering process... ? The next time I do this I will add some unsalted butter to the mix. I do recommend using salted butter because, my understanding is that salted butter has a longer self life as salt is a natural preservative. I like the texture of regular butter better but I also need to rotate through this emergency butter so I use the bottled butter for some of my baking recipes and to grease the pans on my home-made rolls. I've not had a difference between salted and unsalted butter results, however, yes, the salt IS better for shelf-life and typically what I'd use butter on to cook with I'd use salt too, so for that I don't mind BUT when it comes to baking, it's important that I have unsalted butter, so the majority of my canned butter is unsalted. I just want to say thanks for writing this article ive been wanting to try this as i always see butter on sale but have so much frozen i don't want to buy more. As for sanitation i wash all my jars in acidic water from my kangen water ionizer first. the acidic water kills any germs on contact on the jars rings and lids. then boil them to get them hot for the pressure cooker.so kind of a double precaution for killing germs.anyways wanted to ask can i pressure can he butter if so for how long? You wont' enjoy the taste of the butter if you pressure can it. I tried caning butter for the first time today, 28 pints, and followed your directions to a tee. After canning, I read the comments and read that some writers boil the butter for up to 15 minutes to reach 180 degrees. I used a candy thermometer (all I had) and after boiling the butter as directed for 5 minutes it reached 105 degrees. I then bottled it etc. Can I still use this butter? I don't ruin the butter with that kind of time or boiling/heat exposure, Sue. If it's butter I've purchased in the store, it's already being made with pasteurized cream in the first place. Kelleen, Thanks so much for the quick reply. I'm not entirely sure what you mean about not ruining the butter with boiling/heat exposure. I'm following your "To Bottle or Not to Bottle Butter" article from June 23, 2009. Are you saying that because it's pasteurized, I don't have to boil it to reach 180 degrees? (I sure hope that's what you mean) If not & if I have to boil it to 180, can I simply remove it from the jars I canned yesterday, boil it to 180 degrees and re-can it? Thanks again for all the help & information/education you supply to us. As long as you hit that temperature, then yes, you're fine. There's no need to go higher in temp beyond the 180. Have you ever canned homemade butter and if so, how? For the past year, that's all I canned. I love it so much more. I canned butter in Feb of 2012. 4# salted mixed with 4# unsalted. Sterilized everything as usual. Processed in Pressure canner at 10# pressure for 60 min. Shook as cooling. 8# made 21.5 pints. First jars were used were wonderful. Unused and perfectly sealed jars are now faintly darkening with age. They are stored in a cool dark environment in my basement. We are still using them with no ill effects but my daughter mentioned the other day that she thought my butter smells like cheese. I hadn't noticed but she was right. My aged butter is turning into cheese! Is it still safe? Should I throw it out? Have you heard of this before. Has anyone had this happen to their canned butter? You've WAY overprocessed your butter with pressure canning it--and for so long as well. That's why it's moved on to developing into another stage. I canned butter a couple weeks ago using a method I found on another website (melting it in the jars in the oven). I opened and used one jar to see what it would be like and I was disappointed - it was a little grainy and runny. I had even put them in the fridge after canning them. Any idea what I could have missed? I canned 36 half-pints. Should I try recanning them? Definitely don't recan them...no. It won't improve in the least. What did you miss? Um....that would be MY instructions--particularly the solar oven method. Do you have your Solar Oven method of canning butter on U Tube? Nope, I've not made it into a YouTube video yet. I don't recommend doing this. It goes against food safety guidelines. I did mine in a pressure canner just to be safe, This is so not wrth the risk. Just my thoughts. My father in law was a food safety professor at Perdue and Penn State. I am not a beginning canner. I canned several jars of mixed butter( half salted and half unsalted) and they turned out great. I wanted to make just salted butter. I followed the directions and my butter did not solidifie. Can it be saved? I made 12 pints and would be most thankful for your response.